George Ellison has lived near Bryson City in the mountains of western North Carolina adjacent to the Great Smoky Mountains National Park and the Cherokee Indian Reservation since 1973. George and his wife Elizabeth were recipients of the 2016 "Blue Ridge Naturalist of the Year" award given by the Blue Ridge Naturalist Network, which is an outgrowth of the Blue Ridge Naturalist Program through the North Carolina Arboretum. George is the 2012 winner of Wild South's Roosevelt-Ashe Conservation Award for Outstanding Journalist in Conservation, one of six such awards recognizing different roles in conservation. "These awards recognize present day conservation heroes for their contributions to protect wild places and wild things across our region" said Tracy Davids, Wild South's Executive Director. "Like Teddy Roosevelt and W.W. Ashe for whom our and awards are named, their work exemplifies passion, dedication, and leadership." In 2012, George returned to poetry with Permanent Camp: Poems, Narratives and Renderings from the Smokies, a collection of poetry and prose celebrating living in and observing the natural world of the Smokies, and illustrated with his wife Elizabeth's art. Permanent Camp is about their lives raising a family and making a life as a writer and artist inspired by the local landscape. (June, 2012, The History Press). Read excerpts Read a review by Rob Neufeld, Asheville Citizen-Times. He wrote the biographical introductions for reissues of two Southern Appalachian classics: Horace Kephart’s Our Southern Highlanders (Knoxville TN: University of Tennessee Press, 1976; originally published 1913) and James Mooney’s History, Myths, and Sacred Formulas of the Cherokees (Asheville NC: Historical Images, 1992; originally published 1900). In 2009, he wrote the biographical-critical introduction for Kephart’s posthumous “lost” novel, Smoky Mountain Magic (Gatlinburg TN: Great Smoky Mountains Association), based on a typescript dated 1929. 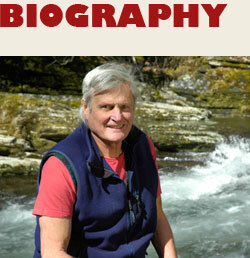 He co-wrote with Janet McCue an introduction for a reissue of Kephart’s Camping and Woodcraft (Gatlinburg TN: Great Smoky Mountains Historical Association, 2011). A collection of his essays, Mountain Passages: Natural and Cultural History of Western North Carolina, was published in 2005 (Charleston SC: The History Press). In 2006, the same press published A Blue Ridge Nature Journal: Reflections on the Appalachians in Essays and Art, a large format volume that includes 30 of his essays on the natural areas, flora and fauna of the southern mountains, as well as 40 full-color watercolors and 30 illustrations by his wife, Elizabeth Ellison. It was a finalist for the SIBA (Southern Independent Booksellers Alliance) non-fiction book of the year award. A smaller format edition was published in 2007 as Blue Ridge Nature Notes: Selections from Blue Ridge Nature Journal. The Ellisons edited and illustrated a two-volume collection titled High Vistas: An Anthology of Nature and Descriptive Writing from Western North Carolina and the Great Smoky Mountains. Volume I (1643-1900), published 2008. Volume II (1901-2007), published 2011. He writes the Nature Journal column for the Asheville Citizen-Times (since 1988) and the Botanical Excursions column for Chinquapin: The Newsletter of the Southern Appalachian Botanical Society (since 1991) both illustrated by Elizabeth, as well as the Back Then column for Smoky Mountain News (since 2000), a newsmagazine published in Waynesville NC and distributed in the seven westernmost counties in NC. He has participated in research, production, and (in the first two instances) the film versions for three documentaries of either regional and national significance: as writer and co-host, with Lance Holland, for Nantahala: Land of the Noonday Sun (Robbinsville NC: Appalachian History Video Series, 1999): as the “talking head” for Horace Kephart in Paul Bonesteel’s PBS documentary, The Mystery of George Masa (Asheville NC: Bonesteel Films, 2003); and as credited research consultant for the Great Smoky Mountains National Park segment of the Ken Burns PBS documentary National Parks: America’s Best Idea (Walpol NH: Florentine Films, 2009). Each year, he conducts natural and human history workshops for the North Carolina Arboretum, “The Native Plant Conference” at Western Carolina University, The University of Tennessee’s “Smoky Mountain Field School,” The Great Smoky Mountains Association, The North Carolina Center for the Advancement of Teaching at Cullowhee NC, The Highlands (NC) Biological Station, and The Intentional Growth Center at Lake Junaluska NC.